Hartnett Flooring > Blog > Articles > What is Engineered Wood Flooring? Have you seen ads for engineered wood flooring, but don’t really know what that is and how it differs from regular wood floors? Read on to learn all about it. Engineered wood is made by fusing multiple plies (layers) of wood together under very high pressure and heat. Solid hardwood, however, is just one piece of wood milled from a single tree. The end result of engineered wood looks just like solid wood, but is actually stronger and less susceptible to humidity. Engineered wood is constructed with a top layer of solid wood just like a regular wood floor, only much thinner. This is often called a veneer, skin or lamella. Then come a few (usually 3, 5 or 7) layers of plywood cross-layered with each other. 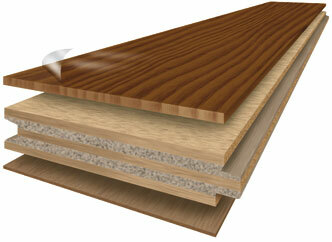 Finally, the bottom is a hardwood backing layer as shown in the diagram. The additional strength engineered wood floors offer make them suitable to use in basements and areas that are prone to humidity. However, there are also some disadvantages to using them compared to solid hardwood floors. Because the veneer is very thin, engineered wood floors cannot be sanded as often to repair blemishes and scratches. They are also usually factory-finished, so be sure to choose the right finish for your project because staining them is more difficult than solid wood. Getting the more expensive 7-layer flooring provides a thicker veneer that can be sanded about twice if need be. The thinner, cheaper options can perhaps be sanded once or not at all, depending on the thickness of the veneer. Engineered wood flooring is indistinguishable from hardwood once fully installed. Only the top layer, the veneer, is visible, so it looks just like a solid floor would look. The core plywood can be made from a different, more abundant wood than the veneer, so manufacturers can save lumber costs whilst still offering a strong, attractive product. However, the cost of construction is higher as the different plies need to be fused. Are you likely to have many scratches & blemishes that will require sanding and polishing the wood again? Hartnett Flooring can install and repair all types of wood floors, including engineered wooded floors. Call us for advice and a free quote.